*Any combination of operating while intoxicated (drugs or alcohol), impaired driving, High BAC and 1 offense for zero tolerance may be counted. For a first time revocation, a person is not eligible for a driver’s license appeal hearing until the expiration of one (1) year. The waiting period for a second revocation is five (5) years. Additional periods of mandatory revocation are imposed when someone receives driving violations while in in revoked status. Additional periods of revocations run consecutively for those caught driving on a revoked license making them ineligible for any driving privileges for several years. The ABDO LAW FIRM provides comprehensive legal services to those that have lost their Michigan driver's license because of multiple drinking and driving and/or substance abuse convictions. We can help you regain your driving privileges if your revocation has been reinstated based upon major violations of the ignition interlock system. ABDO LAW has fought and won major interlock violation cases involving allegations such as tamper/circumvent, rolling retest and unauthorized removal of ignition interlock device. Cases are more difficult when they involve major violations based upon positive alcohol samples recorded on the BAIID device. The Driver License Appeal Division is not kind to alcohol violations where a third party is blamed for using the BAIID device or those that are based upon accidental ingestion of cold medicine (Nyquil has 25% alcohol content) that contains alcohol. It is imperative to act promptly upon receiving a notice of revocation reinstatement as a response must be filed within 14 days. Document the incident for future evidence should a hearing be required. ABDO LAW charges a flat rate of $1,750.00 to represent those with a revoked Michigan license based upon a combination of not more than two (2) drinking and driving and/or substance abuse convictions. This fee covers all legal services to get the first hearing before the Administrative Hearings Division of the Michigan Secretary of State. The attorney fee for those with a complex substance abuse history (more than 2 drinking and driving and/or substance abuse convictions, on/off relapse history, prior unsuccessful license appeal hearings) will vary depending upon the circumstances of each case. We will gladly quote a fee after we have reviewed the potential client’s background. License restoration hearings are conducted according to the Michigan Rules of Evidence. The success of an appeal will depend upon the quality and credibility of the evidence presented. Inconsistent or unreliable evidence is a recipe for disaster that will make future appeals more difficult. 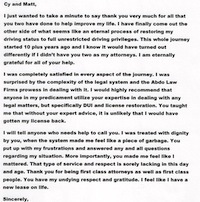 Anyone that has done it alone can tell you that an experienced license appeal attorney is essential. ABDO LAW has attended license appeal hearings for several decades. Our experience gives us an advantage because we know what evidence will satisfy the burden of proof to the satisfaction of the hearing officers. Our driver license restoration format is a winning formula to get your Michigan driver’s license restored. The first consultation sets the stage for the entire license restoration process. At this meeting, we prepare an individual case strategy by discussing such things as our client’s unique substance abuse history, sobriety date, relapse prevention program and positive lifestyle changes. At the conclusion of the first consultation, our client will be given an outline of documentation that needs to be returned to our office before a hearing can be requested. Also, we may also recommend a substance abuse counselor and provide our clients with sample character letters. A copy of the master driving record at the first consultation. Driving records can be obtained at a Secretary of State office. It takes most clients about 30 to 60 days to return all of the required documents before we can request an appeal hearing. 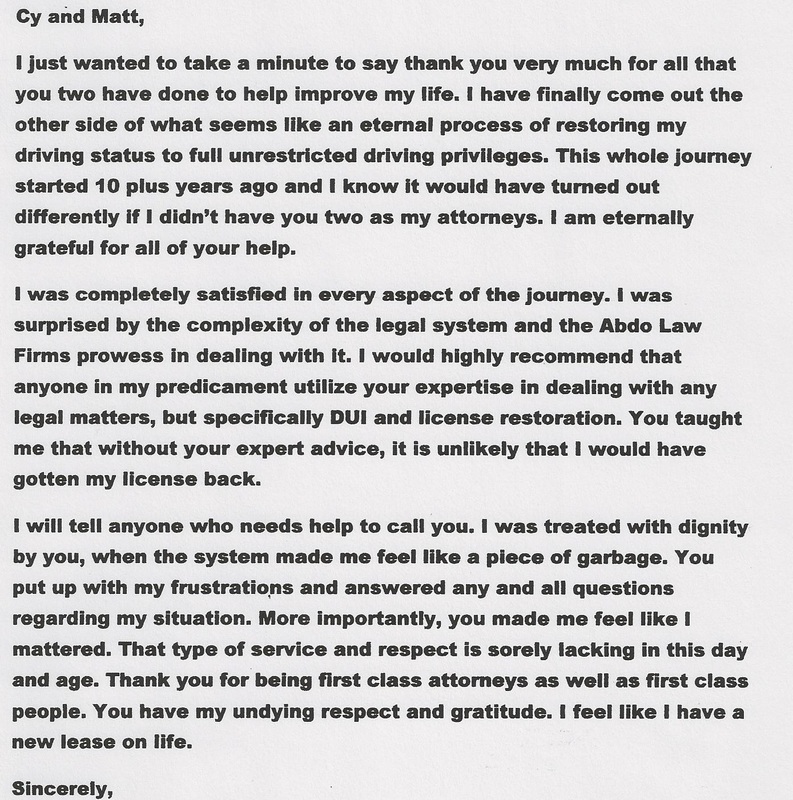 Sometimes, a longer period may be appropriate when a person needs to resume AA meetings or counseling to improve a case. Once a hearing is requested, it takes about 2 to 3 months before the hearing date is scheduled by the Michigan Department of State. Hearings for individuals that reside in Wayne, Oakland, Macomb or St. Clair Counties are scheduled at the one of the following locations. Click here for a link to all of the Secretary of State hearing offices throughout Michigan. Prior to the hearing, we conduct a mock trial at our office. Our attorneys have attended DLAD hearings with several different hearing officers and know all of the difficult questions that will be asked at a license appeal hearing. By conducting a simulated hearing at our office, our clients will be prepared and confident when called upon to answer questions that may arise at the license appeal hearing. Do you ever go to places where alcohol is served? Do you live with anyone that consumes alcoholic beverages? Do you keep alcohol at your home? What would you do if you had an urge to drink again? Why didn’t you stop drinking after your first offense? Do you take any medications for sleep, depression or pain? What is your duty and responsibility if you are granted driving privileges? We are veteran license appeal lawyers and will personally attend every license appeal hearing, stand by your side and advocate for the restoration of your license. The following links have been selected by the ABDO LAW FIRM to provide you with additional information which pertains to the complex legal practice area of license restorations. Haven't you waited long enough? The ABDO LAW FIRM has a proven track record of winning DLAD hearings. By being 100% prepared and committed to your sobriety, you will be able to meet the strict burden of proof pursuant to MCL 257.313 and get back on the road!